Paraiba tourmaline gems are small, rare and precious; they are commonly found in Mina da Batalha in the Federal Brazilian State of Paraiba. The turquoise to green colours of the gem is what makes the gem so unique and legendary as there are no other gems that are of this colour. It is the rarity of paraiba tourmaline gems that make them real treasures. The Paraiba tourmaline gem was first discovered in 1989 in the Brazilian State of Paraiba by a miner named Heitor Barbosa. Barbosa had been working the Mina da Bathalha for over 5 years prior to finding the rare gem. When the gem was found it had an unusual vivid blue-green colour that had never been seen in any gem before. It was said to have a glow that appeared neon or electric-like quality, even within the rough stone. Research has proven how this was primarily due to the presence of copper and manganese. Paraiba tourmaline was said to be first publicised in a yearly Tucson gem show which took place in 1990, resulting in it becoming a huge sensation. At this time the price for the gem was around $3000 per carat which deemed as very expensive, however nowadays this price for paraiba tourmaline seems rather low. Market demands for the gemstone were very high but due to the supply being limited, it became almost impossible for gem dealers to buy any amount of stock. This problem was quickly resolved in 2001 when the paraiba tourmaline gem was found in Nigeria. Having said this, the colour saturation of the Nigerian gem wasn’t as defined as the Brazilian material. By 2005, paraiba tourmaline was also found in Mozambique. The gem was found in various colours ranging from green to blue-green and violet. The Mozambican paraiba gems are said to be cleaner than the Brazilian gems and are often found in much larger sizes. 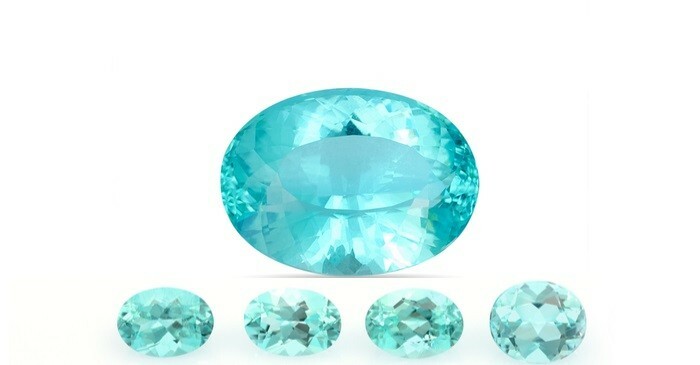 Prices for paraiba tourmaline gemstones are deemed quite high. Price values, predominantly those of sizes between 3 and 5 carats, can cost around $10,000 per carat. Other tourmaline gems such as rubellite reds and chrome greens have never cost as much as paraiba tourmaline gems, this is predominantly down to the rarity of the gem and the fact that it’s only found in a very niche part of the world.